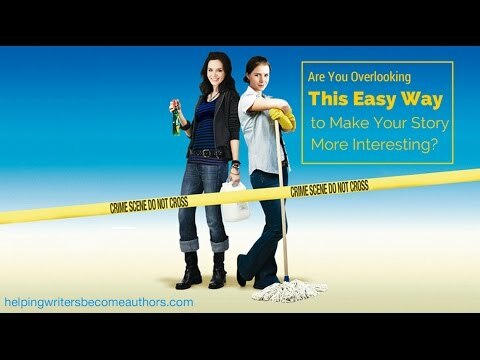 An example from Christine Jeffs’s Sunshine Cleaning to show how you can use your character’s job to make your story more interesting. Over on Twitter, my daily #writetips have been focusing on the importance of making your protagonist’s career a conscious decision, since it can influence your story in so many ways. But one thing I haven’t yet touched on over there on Twitter is how your character’s job can actually end up being an insanely easy way to add an extra layer of interest to your story. This is true even if your character’s job only enters the story in an oblique way. But, of course, it’s even more pertinent when the job will have an important impact on the plot. Christine Jeffs’s Sunshine Cleaning is a good example. Stripped down, this is just a simple story of two sisters struggling to find purpose and focus in their lives after the suicide of their mother when they were children. It’s really not a story we haven’t all seen dozens of times. But what makes it work, what made it hold my interest at any rate, was the choice of the sisters’ occupation—the titular Sunshine Cleaning Company, which despite its chipper name is actually a biohazard removal service. This is just a fancy way of saying that they go in and clean up gory, stinky crime scenes, after people have shot themselves and each other, among other cheerful scenarios. That’s not a job we see in your everyday, garden-variety story. Fact is it’s not a job many of us have even consciously realized was a job. So it has an instant interest factor. Throw in the important fact that it neatly ties back in with the theme of the sisters having to work through their own junk about their mother’s graphic and traumatizing death, and it nicely rounds out what might otherwise have been a very run-of-the-mill and highly forgettable story. So in choosing your character’s career, stop to think about how you can take advantage of this opportunity to bring extra color and interest to your story in a relatively easy way.